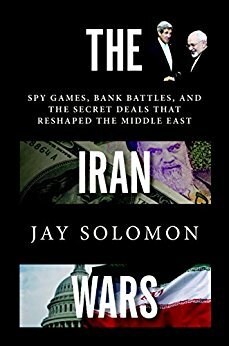 In the latest episode of the Professional Military Education podcast, I interviewed Wall Street Journal reporter Jay Solomon to discuss his book The Iran Wars: Spy Games, Bank Battles, and the Secret Deals that Reshaped the Middle East. I really enjoyed reading this book, and learned a lot about the history of Iran-U.S. relations since the Iranian Revolution of 1979. Mr. Solomon does a great job covering the conflict and the events that led to the nuclear deal that was completed in July 2015. In the interview, we discuss “irregular” forms of warfare that have been used to include cyberwar, economic sanctions, and proxy battles. We cover recent events in the Middle East and explore Iran’s role in Syria and their strategic objectives in the Middle East. The interview also looks at North Korea’s nuclear program as we talk about the differences and similarities between Iran and North Korea. The conversation is extremely informative. In two hours, Jay and I cover a lot of ground. Check out the interview and share with friends and family if you find it useful. Also, check out the notes and resources below. Enjoy! The U.S. historically supported Iran as an ally in the region against the Soviet Union. Iran is a Shiite dominated country. They view themselves as the historical great power in the region upholding the legacy of the Persian Empire. To counter the U.S., Iran allies with enemies of America to include Sunni groups and secular regimes. Their strategic objectives include spreading the Islamic revolution to other countries to include Iraq, Syria, Lebanon, Yemen, and Palestinian territories. The Iranian Revolutionary Guard Corps was established to protect the revolution at home, but they also use the Quds force to export the revolution abroad. The Quds force, which comes from the word al-Quds meaning “Jerusalem”, is led by Major General Qasem Soleimani The Quds force has mobilized “tens of thousands of fighters in Syria” and continues to actively support Hezbollah and Hamas. Mr. Solomon told me that a good writer to follow for information on Quds force is Ali Alfoneh with the American Enterprise Institute. Shortly after the Iranian Revolution, Saddam Hussein invaded Iran on September 22, 1980. Saddam saw Iran in a weakened military position, and sought to reclaim disputed territory with oil reserves. What followed was a bloody eight-year war in which Iraq eventually used deadly chemical weapons against Iran. After the terrorist attacks of September 11, 2001, there appeared to be a slight window in which rapprochement between Iran and the U.S. might have happened. However, with fundamentally misaligned strategic interests, this window quickly closed. The U.S. invasion of Iraq evolved quickly into a proxy battle in which Iran sought to use the Quds force to assert their influence. They funded Shiite based militias and supported businesses and politicians that supported their interests. Part of the U.S. rationale for an invasion dated back to the thinking that Iraq might be a Shiite ally used to counter Iran. This thesis was developed in a book by David Wurmser called Tyranny’s Ally: AMERICA’S FAILURE TO DEFEAT SADDAM HUSSEIN . The Quds force under Sulemani continues to aggressively fund Shiite militias. The Quds force is used to serve Iran’s military and political objectives throughout the Middle East. Iran’s nuclear program accelerated under hardline President Mahmoud Ahmadinejad after his election in 2005. In 2006, the U.S. responded to Iran’s nuclear program with tough sanctions targeting companies that did business with Iran. The goal was to cut Iran off from the international banking system and by 2012 this goal was largely achieved. Another attempt to counter Iran’s nuclear program included the use of malware (aka the “Stuxnet” virus), which caused Iranian centrifuges to spin out of control. In response, Iran developed their own cyber weapons capabilities. Here is an article on Iran’s emerging cyber capabilities. When President Obama took office, he shifted the strategic focus to direct engagement with Iran. He indicated clearly that the U.S. did not want regime change in Iran. However, his policy included many initial hurdles to include Iran’s “Green” movement. Additionally, military action was not used against Syria. Mr. Solomon suggests that restraint against Syria was to prevent Iran from walking away from nuclear negotiations. In November 2013, an interim agreement was concluded and led to the final nuclear agreement in July 2015. U.S. diplomats scaled back on initial “redlines” to include no enrichment, no missiles, no arms exportation. In ten years after the agreement, Iran will be able to have an industrial scale program to produce as much fissile material as they want. Mr. Solomon says that Iran’s negotiators knew the US political system better than U.S. diplomats understood the Iranian political system. For example, Javad Zarif was a “very smooth, western educated diplomat,” who worked directly with Secretary of State John Kerry. Twice since the 2015 agreement, Iran has nearly breached the terms of the deal. In one case the U.S. bought heavy water used to create plutonium from Iran. Russia bought the heavy water in the second instance. As the Middle East continues to be mired in conflict, the IRGC retains significant influence. The U.S. must calculate the IRGC and Iran’s proxies with any action taken in the region. Can the Iran sanctions model work against North Korea? China is the most important decider of North Korea’s economic fate. Can cybertechnology be used against North Korea? Is it possible to disrupt North Korean supply chains that support their missile development? Sanctions have been used and China recently banned coal imports from North Korea in compliance with international agreements.